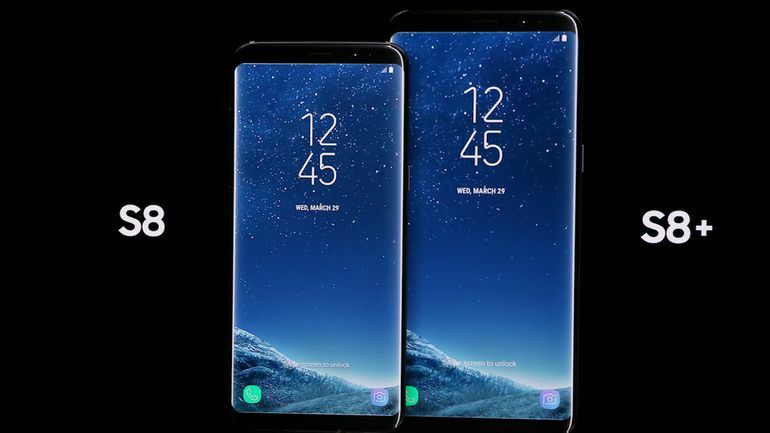 After the so many rumored and leaked images of Samsung Galaxy S8, Samsung finally unveiled its new Galaxy S8 and Galaxy S8+ smartphones on Wednesday. Samsung has to face little trouble because of the flop show of its Note 7 technical issues. This time Samsung don't want any issues which can put the company in trouble again. There is no doubt that you may be amazed by knowing the features of new Samsung Galaxy S8 and Galaxy S8+. With this new Galaxy S8 and Galaxy S8+ smartphones, Samsung is ready to compete with its rivals. Apple also recently launched its new RED iPhone in iPhone 7 and iPhone 7 Plus segment. Lets take a look how Galaxy S8 and Galaxy S8+ will compete with Apple's iPhone 7 and iPhone 7 Plus. Samsung Galaxy S phones features faces that are each 83% screen. The side bezels are there but the thinned bezels above and below the display is something new. This new design will give best experience to the users and also lloks great. Samsung's new Quad HD+ Super AMOLED displays are the most stunning smartphone screen. Samsung calls it an "Infinity Display." Apple mainly used the same iPhone design for three consecutive years. The gap between Apple and its rivals has never been wider than it is now. Samsung introduced curved edges was designed to get attention. This time curved front and back glass on the Galaxy S8 and Galaxy S8+ make the phones so thinner. Curved edges make so comfortable in the hand. Samsung's new DeX station accessory allows users to dock their Galaxy S8 or S8+ and connect it to a monitor, keyboard and mouse. The desktop optimized Android experience is lightning fast. It looks and feel a lot like Chrome OS. While any app is running in desktop mode, Samsung's own apps have been optimized for the Desktop Experience. Samsung's Galaxy S8 and Galaxy S8+ include the Iris scanner from last year's ill-fated Galaxy Note 7. Users can use it to unlock the phone or to gain access to the handset's secure folder also. Apple introduced the first iPhone with Touch ID fingerprint scanner but it is now available in every smartphones for quick unlocking. With this new security options, S8 and S8+ include full facial recognition enable by the 8 megapixel front facing camera. Face recognition can be used to unlock the phones. Samsung is giving users their choice of virtual personal assistants. Samsung includes popular Google Assistant on the Galaxy S8 and Galaxy S8+ with its new personal assistant Bixby. Samsung's Bixby Vision uses object recognition, text recognition and location data to add more functionality to its personal assistant. Bixby can see object using camera and offer information of them. Bixby can also translate text in more than 50 languages. Third party developers will also get access to Bixby Vision. Apple has the power full smarphone chipsets but this time Samsung will give fight to Apple with the Galaxy S8 and Galaxy S8+. The Snapdragon 835 and Exynos 8895 are 10nm chips which will offer improvement in performance and efficiency. Apple also working on a new 10nm SoC and may be next iPhone will come with 10nm. Apple is working on wireless charging for next generation iPhones but Samsung phone have supported wireless charging for years. New Galaxy S8 and Galaxy S8+ come with wireless charging support including Samsung's own fast wireless charging tech. I use a tracking app from MxSpy http://mxspy.com/how-to-hack-a-phone/ to hack a phone. I don't try to track group chats, but I think it should work.